At least one in 10 Americans is allergic to penicillin — or so they think. Specialists at Massachusetts General Hospital and around the country are calling for more testing of whether patients are really allergic, because research finds that most who've been told in the past that they are allergic to penicillin actually are not. And that matters for their care. Take Michael Wigdor, from Stoughton, Massachusetts. Forty-odd years ago, for a medical reason he no longer recalls, he got a penicillin shot. "And I fainted, is what they told me," he says. "I started to feel faint, and they said then that could be an allergic reaction, so they wouldn't prescribe penicillin for me anymore." Sheryl Wigdor, his wife, broke out in an itchy rash after taking penicillin as a kid, so she had penicillin allergy marked in her medical record as well. But when the Wigdors, now in their 60s, recently underwent allergy testing, it turned out they both tolerate penicillin just fine. "I see patients like them every week and I'd love to see more of them," says Dr. Karen Hsu Blatman, the Wigdors' allergist at Brigham and Women's Hospital. "Patients come in with an old childhood history. Do these patients still have a penicillin allergy or not? Did they outgrow it? Did they even ever have one?" Among patients believed to be allergic, "in the overwhelming majority of cases, a formal evaluation shows that your chances are 19 out of 20 that you can take penicillin safely," says Dr. David Lang, president-elect of the American Academy of Allergy, Asthma and Immunology. "If you consider yourself to be allergic to penicillin, you shouldn't be complacent," he says. "You should discuss this with your physician." Evidence of a problem with incorrect penicillin allergy labels — that they are common and can cause significant harm — has been mounting gradually. At Mass. General Hospital, infectious disease specialist Dr. Erica Shenoy and allergist Dr. Kimberly Blumenthal have been focused on this issue for more than five years. They call for more testing of allergies in the latest issue of the journal JAMA. Penicillin and related medications are highly effective drugs, and generally better than the alternative antibiotics used to treat allergic patients, according to Shenoy. "They're very good drugs to treat a whole host of infections and also to prevent infections, for example to prevent infections in patients who are undergoing surgery," Shenoy says. And, Blumenthal says, the term "allergy" is applied to penicillin reactions far too broadly. Even when a penicillin allergy is confirmed, it tends to wane, she adds. "So the patients who have had skin tests that were positive to penicillin — they really have a true penicillin allergy — if we wait a period of 10 years, most of them, the majority, are not allergic." But they're still believed to be allergic, and that means they're likely to be given "broader-spectrum" antibiotics. That's not good, Shenoy says. Use of broader spectrum antibiotics contributes to the rise of resistant superbugs. "It can also lead to treatment failures," she says. "And we know this in a variety of different infections, when alternative antibiotics are used, that patients are more likely to have a treatment failure — which is not curing the infection." The two specialists worked on a study of more than 9,000 patients looking at infections after surgery — serious complications that might, for example, mean that a replacement joint has to be taken out. In patients who "just had the label of penicillin allergy, there was a 50 percent increase in the risks that they would get a surgical site infection," Shenoy says. That heightened risk speaks to the importance of patients bringing up the topic with their doctors when they have an operation planned, she says. A patient might say something like: "You know I've had this penicillin allergy on my record. I'd like to get that evaluated because I know that it will influence what antibiotics you'll be able to use in the operating room." The two specialists also suggest that patients with penicillin allergies bring up the question of getting tested at their annual check-up. Michael Wigdor, who is the co-host of the cable TV show "Sports Wrap," says his testing, which was covered by insurance, did take two or three hours, for skin tests and then being monitored as he took increasing doses of penicillin pills. At Mass. General, some low-risk patients can skip the skin tests and find out if they're really allergic within about an hour. The hospital's drug allergy program is now testing hundreds of patients a year, says its director, Dr. Aleena Banerji, working particularly with infections, surgery and pregnancies — all areas where the need for antibiotics could be imminent. Amid calls for more testing, the program is ramping up to handle more patients, she says, "knowing that there may be an uptick at this point." 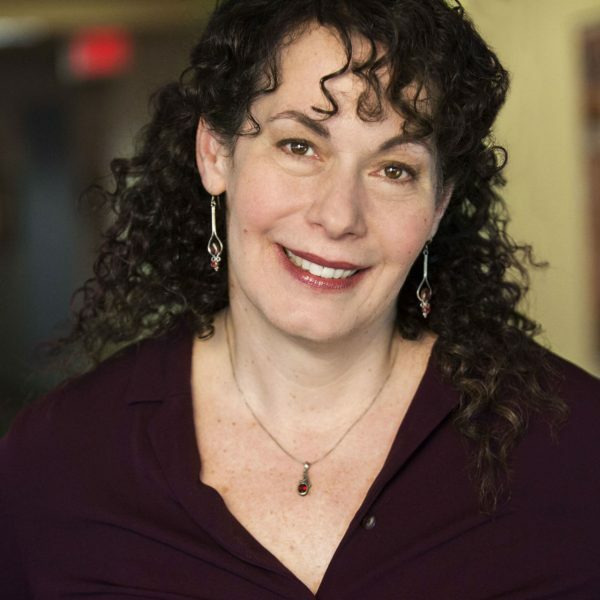 "We have to find the way to fit these patients in, get them seen, because they're going to have much better outcomes if we're able to clarify that penicillin allergy up front," she says. Wigdor has no regrets about getting tested. "It's a relief," he says, "to me, it's a relief. Because if you have a major bug or something, and you need to have an antibiotic, you know you're not allergic to it. They can just give that to you." 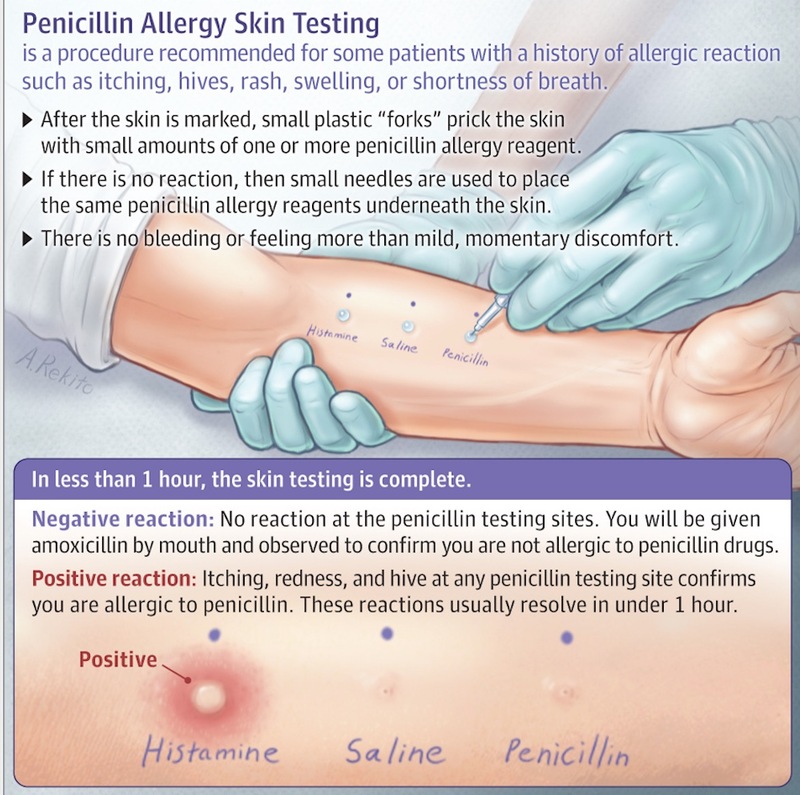 For more on penicillin allergies, the American Academy of Asthma, Allergies and Immunology FAQ is here and a JAMA page for patients is here.